Monday, March 11 from 8:30 a.m. – 3:00 p.m. 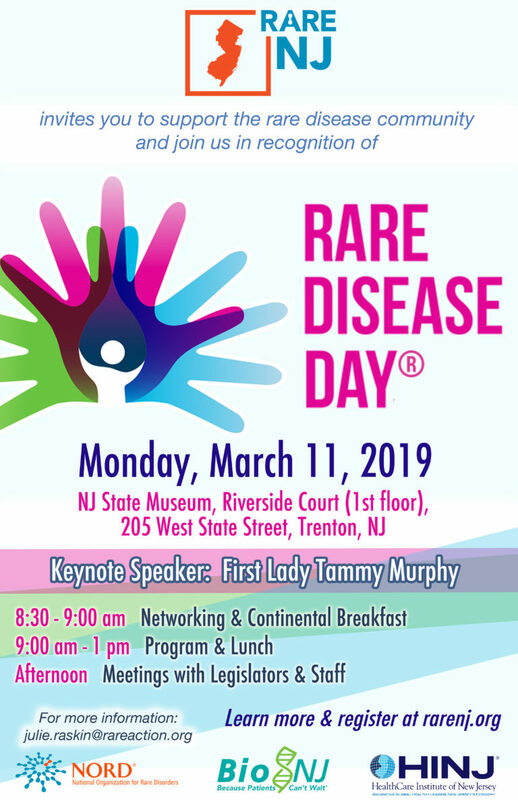 Please join the New Jersey Rare Action Network for a free Rare Disease Day advocacy event. Patients, families, caregivers, medical professionals, industry representatives, and elected officials and their staff are invited to attend to learn about real world advocacy from New Jersey legislators and about the rare disease patient journey from those who live it. First Lady Tammy Murphy, who takes a special interest in infant and maternal mortality, will provide a keynote address. The event will be held at the New Jersey State Museum at 205 W State Street, Trenton. Join us at 8:30 a.m. for networking and continental breakfast followed by our program. Lunch will be provided at noon followed by legislative visits at the New Jersey State House at 125 W State Street, Trenton.